Abstract: The brain has evolved to understand and interact with other people. This talk focuses on how the social brain, that is the network of brain regions involved in understanding others, develops during adolescence. Adolescence is a time characterised by change - hormonally, physically, psychologically and socially. Social cognitive processes involved in navigating an increasingly complex social world continue to develop throughout human adolescence. In the past 20 years, neuroscience research has shown that the human brain develops both structurally and functionally during adolescence. Areas of the social brain undergo significant reorganisation in terms of structure and function during the second decade of life, which possibly reflects a sensitive period for adapting to the social environment. I will discuss the importance of taking into account the social environment and the social brain when considering adolescent-typical behaviour. 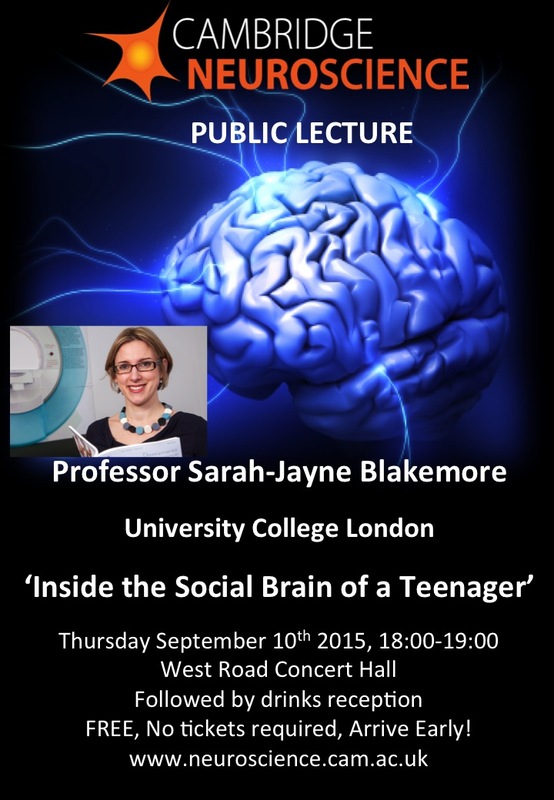 Biography: Sarah-Jayne Blakemore is a Royal Society University Research Fellow and Professor in Cognitive Neuroscience at UCL. She is Leader of the Developmental Cognitive Neuroscience Group and deputy director of the UCL Institute of Cognitive Neuroscience. Her group's research focuses on brain development in human adolescence. Professor Blakemore studied Experimental Psychology at Oxford University and then did her PhD at the UCL Functional Imaging Lab with Chris Frith and Daniel Wolpert, investigating the self-monitoring in schizophrenia, followed by a postdoc in Lyon on the perception of causality. Since 2003 she has held a series of Royal Society Research Fellowships at UCL. She has received numerous awards including the Royal Society Rosalind Franklin Award 2013. Sarah-Jayne is actively involved in Public Engagement with Science: she frequently gives public lectures and talks at schools, has worked with the Select Committee for Education, and acted as scientific consultant on the BBC series The Human Mind. Sarah-Jayne has an interest in the links between neuroscience and education. She co-authored a book with Professor Uta Frith called The Learning Brain: Lessons for Education. She sat on the Royal Society BrainWaves working group for neuroscience, education and lifelong learning and the Royal Society Vision Committee for Science and Mathematics Education. She was recently interviewed on the BBC Radio 4 programme The Life Scientific. 1. Blakemore S-J & Mills KL (2014) Is adolescence a sensitive period for sociocultural processing? Annual Review of Psychology 65:187-207. 2. Blakemore S-J & Robbins TW (2012) Decision-making in the adolescent brain. Nature Neuroscience 15:1184-1191. 1. Mills KL, Goddings A-L & Blakemore S-J (2014) Drama in the teenage brain. Frontiers for Young Minds 2:1-5.